Awakening Aether as it appears in Ultimate. Awakening Aether (覚醒天空, Awakening Heavens) is Chrom's Final Smash in Super Smash Bros. Ultimate. When this Final Smash is used, Chrom will lunge forward yelling "Anything can change! ", "Now I'm mad!" or "Your time has come!" and attack with his sword, and any opponent that he hits with it will be caught. If every opponent is caught, the camera angle changes to resemble that of attacks in Fire Emblem Awakening. Chrom then attacks the opponent again with a more powerful sword strike, sending them flying. Chrom using Aether in Fire Emblem Awakening. Aether is a skill from the Fire Emblem series, originating in Path of Radiance as Ike's mastery skill. Chrom can learn the skill in Awakening as a Level 5 Great Lord. Lucina always begins with the skill as her inherited skill from Chrom, as well as Kjelle or Cynthia if Chrom is their father (regardless of whether or not he has it equipped as a skill), and Morgan if Lucina is her mother. In addition, certain versions of Chrom can learn it naturally in Fire Emblem Heroes, while others can learn it through skill inheritance. All three of the lines Chrom can yell when activating this move are lines he says when performing a critical hit or activating an attacking skill (such as Aether) in Awakening. However, in Awakening, he said "Now I'm angry!" instead of "Now I'm mad!". Awakening Aether as shown by a Skill Preview in Ultimate. During his initial release trailer, Chrom's voiceline for calling out "Aether!" is said in a single phrase. However, the final release of the game has him split the word into two syllables, one from the initial step backwards and the other for the actual attack, through adding a pause in the middle of the same voice clip. In the Japanese version, the voice clip had a pause in both the trailer and the final release. 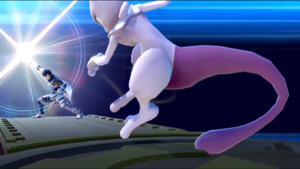 During Awakening Aether, a special camera angle will activate during the second half of the attack, as a nod to the camera angles used in Awakening. However, if Chrom, or his opponent, are near a wall or a large part of the stage when Awakening Aether hits, the camera angle won't activate, and the standard camera angle will be in its place. It's possible that this was done to stop the in-game camera from clipping through the object(s), and obstructing the player's view. This page was last edited on March 30, 2019, at 14:36.